Sandwiched between the vast ranges of the Karakoram and the Himalaya in the far north of India, Ladakh is the highest, most remote and least populated region in the whole country. 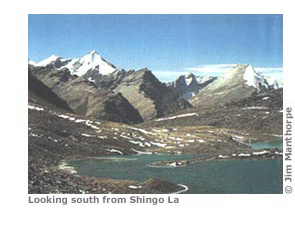 The name is derived from Ladags which means 'the land of high passes'. Its corrugated, arid landscape is often described as a mountain desert which does not do justice to the inherent beauty of its chaotic ridges, twisted and exposed geological strata, snow-shrouded peaks, dark gorges and wide valleys. The eye is relieved from this relentless desolation by the vibrant green oases of the villages, where the resourceful inhabitants make up for the almost non-existent rain by channelling glacial meltwater across miles of precipitous mountainside to irrigate their barley fields and willow groves. It is a land of climatic extremes: fiercely hot days are followed by freezing nights just as the brief summer is followed by a long ice-bound winter, which completely isolates much of the region from the rest of the world for seven to eight months every year. Until recently, Western visitors to Ladakh were rare. Its inaccessibility and hostile landscape initially kept them away and then, just when Ladakh's communications were improving, the Indian government imposed a ban on foreign tourists because of Ladakh's strategic position near the borders with Pakistan and China. Since this ban was raised in the 1970s Ladakh has become a popular destination for aficionados of wild mountain scenery and those interested in a unique culture. As much of the region is accessible only on foot, trekking is the ideal way to explore this fascinating land. At various times in the past, Ladakh has been politically part of western Tibet and this influence is still prominent today throughout most of the region. Indeed it is said that Ladakh is a more accurate representation of Tibet before the Chinese invasion than Tibet itself. The Ladakhi people are principally of Tibetan origin and Tibetan Buddhism is still practised here, as it has been for hundreds of years, alongside a significant population of Muslims. Gompas, or monasteries, overlook the valleys from their solitary positions on top of craggy hills and these religious institutions still play an active role in all Ladakhi life. Even deep in the mountains you are reminded that this is mainly a Buddhist culture as you walk past mani walls and chortens at the entrance of every village, or over high passes where tattered prayer flags flutter from the summit cairn. 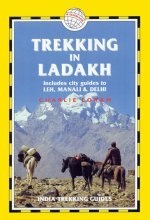 Trekking in Ladakh is very different from hiking in the West as the trails are the lifeline between villages. It's not unusual to find yourself sharing the trail with a lama on his way to a remote gompa, or a shepherd making his way up to a high pasture and it is this close interaction with the local people that makes it such an enriching experience. However, unlike the busy tea-house trails in Nepal, where you can guarantee food and shelter every day, in Ladakh you need to be totally self-sufficient. Villages are often several days apart and these subsistence communities grow only enough food to feed themselves. The best way to carry your camping equipment and food is to trek with a local who will bring along one or two pack-horses and will be only too happy to act as your guide and companion. All the necessary arrangements can be made both cheaply and easily in Leh, the atmospheric capital of Ladakh. A trek is a rejuvenating experience. Day by day, mile by mile, you become leaner and fitter, slowly peeling away the constraints of modern life. Time for once is on your side and you have the privileged opportunity to immerse yourself in 'the naked mountains and the blessed sunshine and the merry rosy people' (The Himalayan Letters of Gypsy Davy and Lady Ba by Robert and Katherine Barrett). The trekking industry is still young here and, at present, is free from rules and regulations. Each trekker must therefore accept his or her individual responsibility for ensuring that the magic of what the Barretts called these 'high quiet places' is never lost.